I always wanted to live in a lighthouse. 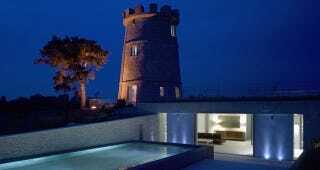 Now I want to live in a lighthouse reformed like the Round Tower, this old English building that was restored and extended into a dream house by architects De Matos Ryan. Some historians say that the Round Tower started its life as a windmill circa 1790 on a crest near Siddington Village, Glouchestershire, England. It was turned then turned into a folly, a decorative building with no real function. The original 32-foot tower was entirely made with stone, measuring 24.6 feet on its base.